Our multi-arts group meets every Wednesday and our creative writing group meets every Thursday. 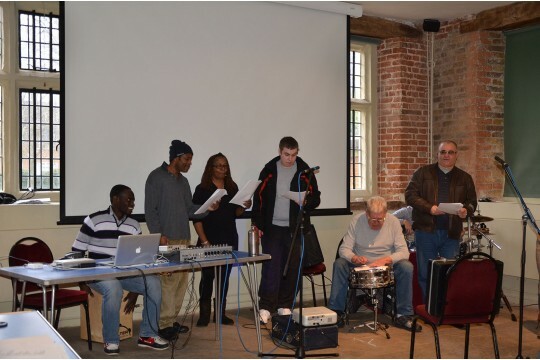 During the sessions we take a multi-arts approach and are currently working towards creating pieces of music, large scale art, performance poetry and exhibition pieces of art to go on display in the local area. Creative for Life is a community arts project for people who have had experience with mental health problems and would like to engage with the community by making artwork within a group setting. Creative for Life aims to offer people opportunities to move forward as part of society, challenging the stigma of mental health, with people from all different backgrounds working together with a common interest in art. We are one of the few organisations who offer programmes of this nature in LBBD. Adults with mental health concerns who are looking for a creative outlet, or those who are looking to socialise in a safe and creative environment, will benefit from this programme. Our participants have voiced increases of confidence and ability, and we aspire to continue this programme.